The Loop Head Peninsula is situated on the West Coast of Clare. It is surrounded by the waters of the Atlantic Ocean and the River Shannon. It is a place of outstanding natural beauty, unspoilt and yet with much to offer visitors.It is often over-looked as a holiday destination but once visited you will want to come back. There are plenty of activities and attractions in Clare to amuse both young and old, below are just a few. Dolphin watching trips are available at nearby Carrigaholt. 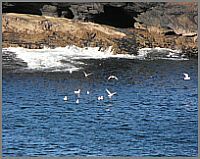 As well as seeing the Bottle-Nosed Dolphins which inhabit the Shannon estuary you will also view at close quarters the beautiful coastal scenery of the Loop Head Peninsula in West Clare with it’s spectacular cliffs, caves and stacks. The Bridges of Ross is regarded as a premier bird watching point on the West Coast of Ireland. Regular sightings include species such as Leach’s Petrel and Sabine’s Gull. The Long-tailed Skua(an extreme rarity in Ireland) has also been sighted. The Bird-watching season has been identified as running from July to November with peak season in August / September. A number of ornithologists visit this renowned bird-watching area every year. Kilkee Golf Club is an 18 hole golfing course set on the cliffs of Kilkee better known as George’s Head. Doonbeg Golf Club is a wonderfully designed Greg Norman Golf Course. This is built on Sand. This is open all year and at the moment they are building a Hotel and Self Catering Houses on the site. 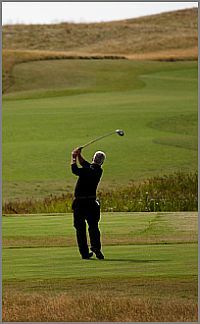 Kilrush Golf Club is an 18 hole Golf course established for many years and with a wonderful Clubhouse. The Long Way Round, Professional guided heritage walks and hikes of the Loop Head region of Co. Clare. A ramble around Loop Head takes in wildlife, history, geology, heritage, scenery and of course the obligatory stops to chat with the locals and enjoy a meal or a coffee. You can please yourself: either wander wherever the road and the mood take you, or try a guided walk led by a knowledgeable local chaperone. The coastal scenery is truly breathtaking. The most westerly village on the Loophead Peninsula. It has a small picturesque harbour with outstanding views of the River Shannon and county Kerry on the other side of the river. Pubs, restaurants and post office are located centrally around the bay. The pier was built in the early of the 19th century to cater for the large numbers of people making their livelihood from fishing, seaweed gathering and piloting the large ships going up the river Shannon to Limerick docks. It also was used by cargo ships bringing supplies to the Loophead lighthouse. The lighthouse, is 4 miles west of the village but its brooding presence is felt everywhere in the area. A lighthouse was first built on the loophead in 1670 but it was not until 1820 that the present tower was built to cater for the increased shipping traffic going up the river to Limerick. It was automated in 1991 and now the lighthouse keepers’ houses have been turned into excellent holiday cottages. Take time to walk the coastal path at Loop Head Lighthouse. It is spectacular. Rhineville Beach – 2 miles from Cross.This is a quiet sandy beach. Carrigaholt Beach – on the River Shannon a nice clean sandy beach. 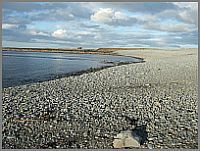 Kilbaha Beach – This is on the River Shannon and is part stone and sand. There is a pier here and boats fish from here. Glasheen Beach – This is a very quiet beach near Doonaha Village and about 2 miles from Carrigaholt. This is a lovely, quiet, unspoilt beach and although it may not be easy to find it is worth searching for. 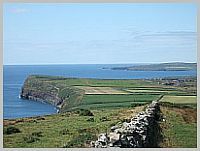 The fantastic scenery of the Loop Head Peninsula has been inspiration for photography, paintings, bronze sculpturing, animated film productions. 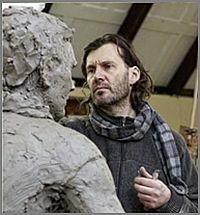 Why not check out some of to our local artists on the Arts & Crafts Trail. Each artist and sculptor has a studio in the Loophead Peninsula promoting and selling their crafts and enhancing West Clare.